The sun wasn’t shining yesterday, but the skills of our students sure were. 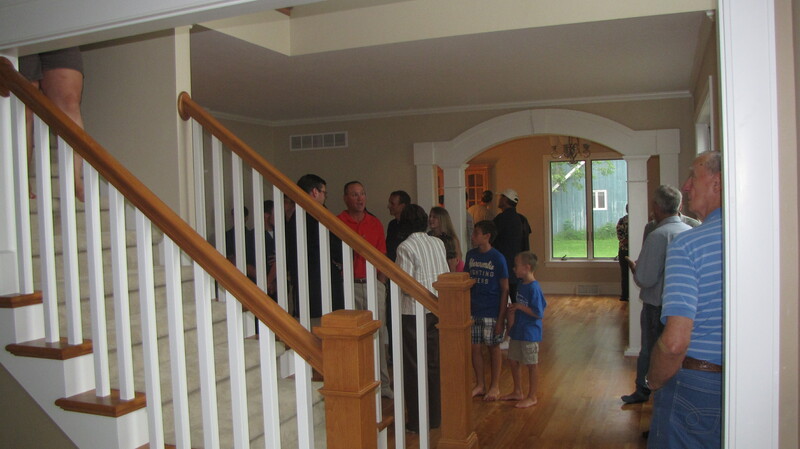 I attended the open house at the home built over the past year in Oshkosh by our Residential Construction students, as well as students from the College’s Wood Manufacturing Technology and Electricity programs. It’s always eye opening to see that these students come from all over the state. There were more than 60 students who worked on this home. Family members of the students and special guests gathered to check out the craftsmanship! This was another project that was no small undertaking and our faculty and students pulled it all together beautifully. This gorgeous 2,300 sq. ft. home featured incredible casework, cabinetry, and flooring, including 1,300 lineal feet of crown molding (that’s almost a quarter mile! ), all meticulously produced and installed. Needless to say, I also met some very happy and grateful homeowners who opened their doors to the students’ families, suppliers, and partners, as well as College staff to celebrate the completion of this project. We couldn’t do projects like this without the support of many area building suppliers, who were also present yesterday to celebrate the craftsmanship that is so apparent throughout the home.